Class D18, London North Eastern Class J20 steam locomotive No 8276 approaching Audley End tunnel with an up coal train, c 1930s. 'The Honourable Artillery Company' steam engine, c 1935. Inside cylinder 2-6-4T Class steam locomotive, c.1930s. Pochard' steam locomotive hauling the Yorkshire Pullman, c 1930s. 'The Royal Scot' steam locomotive, c 1946. 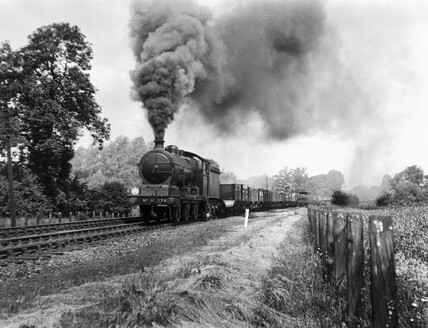 Class J39, 0-6-0 steam locomotive No 2726 leaving the south portal of Audley End tunnel, May 1936. Great Western Railways repair shop at Old Oak Common, London. Railway exhibition at Ilford, 1934.